See the Guardians of Atlantis and the Lightplate Artwork, its pretty awesome. 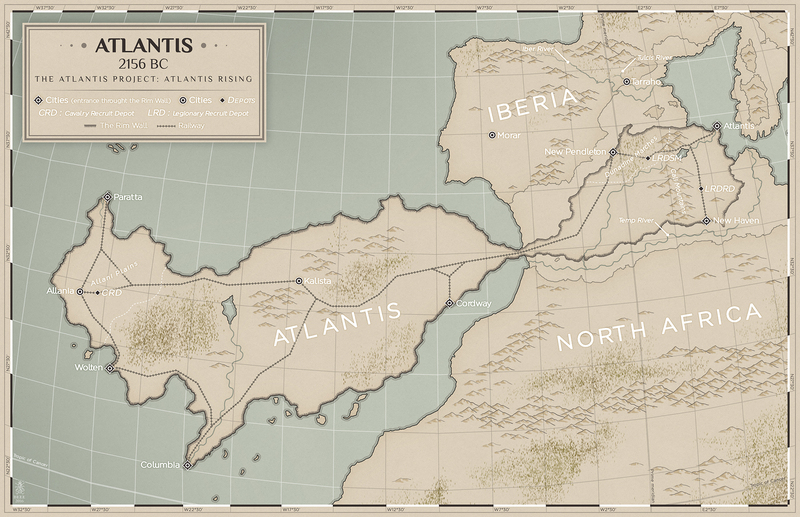 The Map of Atlantis was created by a freelancer on Fiverr. I’ve read a few blogs by different authors, some say that having a map is good, others don’t like having them. Since I obviously have one, I’m going to share the opposing view by Joe Abercrombie. I’m very pleased with my map and glad that I was able to find a cartographer who could do the work. I knew from day one that I would want to have one and I also knew that it would need to be as accurate as possible. Most fantasy stories are set in worlds that don’t exist, so authors are able to create a map from scratch, letting their imaginations go to work. I can see how having to do that could be challenging, the need to be creative, but I can also see how there would be a certain simplicity to it as well. *There will be a few label changes between now and publishing. Atlantis Rising is set in our real world, in an alternate history you could say, so the Map of Atlantis needed some serious work to make it fit. The continent of Atlantis is obviously a product of my imagination, but the land that surrounds it is not, so I needed someone who was both a cartographer and an artist. My first attempt did not go well; you will just have to take my word for it because it will never see the light of day. I let a few weeks go by and then bumped into a French artist on Fiverr, known as MistyBeee. I told her what I needed and this was what she came up with. Want the first three chapters of Atlantis Rising? Click here to get them for free! She did a great job. The City of Atlantis corresponds to a real latitude and longitude and she was able to set it into its correct place. One of the things that you will notice is that Africa is not exactly where it should be. The reason is that when Atlantis was created its birth pushed Africa down, the crumpling created a long mountain range in North Africa that you can see on the map. This mountain range actually has some interesting geological and environmental implications for North Africa that will be revealed later in the story. Also, you can see that the Mediterranean Sea hasn’t filled in yet either. Spain is in the North, known by its ancient name Iberia, which according to Catalan legend was founded by Tubal, the son of Japheth, the son of Noah, and named after Tubal’s son Iber. In Atlantis Rising, Iberia has already been populated by the decedents of Tubal. Anyways, I hope you enjoy the Map of Atlantis, if you do please share it using the social media buttons below. You can see the other artwork of The Atlantis Project in the Gallery. I think it’s awesome! 🙂 Who on Fiverr, did it? Her Fiverr name is MistyBeee. Thanks! I’m very excited to have it, though there are a few changes that I need to make.